During the past year, I’ve been obsessed with the spy genre or even more, movies about robbers. Of course part of the reason comes from the fact that a lot of this films has Alain Delon, Steve McQueen and Robert Redford on them, but more than that, they have an incredible sense of style and elegance, which is nothing more than subjects that the Kingsman franchise plays with by having spies using fashion and accessories as deadly weapons. Not mentioning the incredible cast formed by Colin Firth, Michael Caine, Mark Strong and an exclusive line of wardrobes designed by the amazing Mr Porter. As the new movie is about to come out, I decided to make a list of seven films that you should watch to get in the mood for Kingsman: The Golden Circle. Previously mentioned in the blog at Men Style on 5 Films, the original Thomas Crown Affair seemed to have been blurred out by its remake with Pierce Brosnan. However, we can’t forget the importance of Jewinson film, featuring Steve McQueen as a rich businessman who rob banks out of boredom and the romance he starts with Faye Dunaway, who plays a detective who is trying to seduce him with the plan to catch him. Despite the amazing story and plot twists, The Thomas Crown Affair is known for its outstanding style, from the costume design to remarkable scenes and film grammar, making this spy thriller a must-watch classic. Known to have one of the most famous car scenes of all times, The Italian Job is a funny and sharp smart thriller that tells the story of a famous crook who just gets out of prison and sets a plan to steal a shipment of gold in the streets of Turin by causing a traffic jam. The most interesting thing of this film is how the plot is loose, not following the clichés of the genre, resulting in a very stylish movie about robbery where everything can and will go wrong. Even if you’re not a huge fan of this kind of film, The Italian Job is worth watching just for how this movie was made and how it differs from its genre. It’s hard to choose one film about bank robbery featuring Alain Delon since most of his filmography is composed by such movies, but just like Jean-Pierre Melville, his career had two important movies featuring the same director, and this is the case with Any Number Can Win. Jean Gabin plays a man who just got out of prison after spending years inside because of a previous robbery. But now he has the greatest plan of all and he hires a bunch of men, one of them being Delon, to steal a casino at the french riviera. If that’s not enough reason to watch the film, Any Number Can Win is a beautiful, stylish and elegant movie about the best of its genre, featuring what the french do best. Henri Verneuil comes back now in color, again with Jean Gabin and Alain Delon. The film starts with an amazing sequence where a family tries to free one of its members while he is being transferred to another prison. His escape is just part of a big plan to hijack a plan and steal all the jewelry that is traveling europe for exposition. But as the movie goes along, we start to suspect each character has a secret agenda, resulting in an amazing film full of plot twists and featuring the soundtrack of Ennio Morricone. The first time I watched The Man From U.N.C.L.E, I thought it was a cool movie and all, but it was only after I’ve watched all the previously mentioned films that I realised this is a very interesting and funny homage to the spy movies of the 60’s. 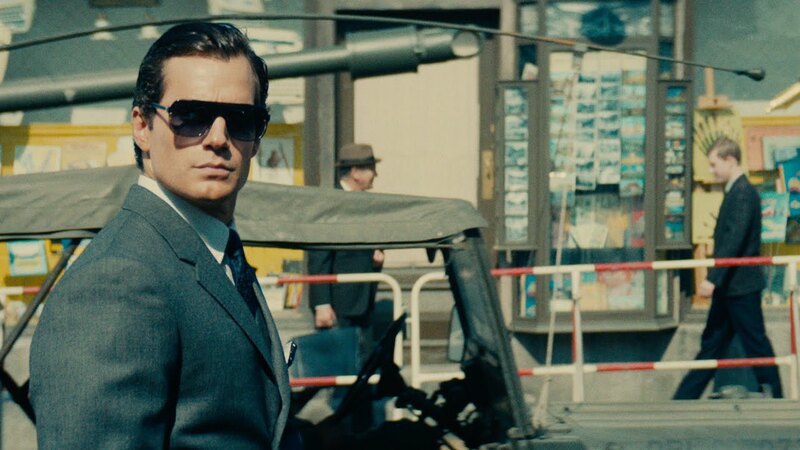 Henry Cavill and Armie Hammer performs one of the best dynamics between two actors in 2015 by playing two different spies who needs to team up with the daughter of a scientist to find the whereabouts of her father to stop the invention of a nuclear bomb. The two spies hate each other and how they interact with one another in the middle of the streets of Rome plus their amazing sense of style is what makes this Guy Ritchie movie work so well. It may have its mistakes, but it’s definitely worth watching! Known for its different approach to the spy genre, The Ipcress File is one of Michael Caine’s most notorious films by playing the detective Harry Palmer, who would get several other sequences throughout the years, being famous as a sort of anti-James-Bond film. More than that, The Ipcress File is an intriguing and stylish movie where Sidney Furie’s direction is marked by a visually modern cinematography and production design. Hired by the IM5, Harry Palmer is a british spy who is called to find the whereabouts of several scientists who went missing. The answer for this mystery is found on a tape recording known as Ipcress, resulting in an ending that you could tell for sure it served as influenced for Matthew Vaughnn on the creation of Kingsman: The Secret Service. And of course, the movie we keep talking about! If you have watched it already, watch it again for the premiere, and if you haven’t, do it before September 28! The movie tells the story of Eggsy, a young troublemaker with a good heart whose dad was a spy who died in action. Growing up not knowing about his father profession, Eggsy is summoned by the secret organisation to fight another organization who is planning to seek the end of the world.